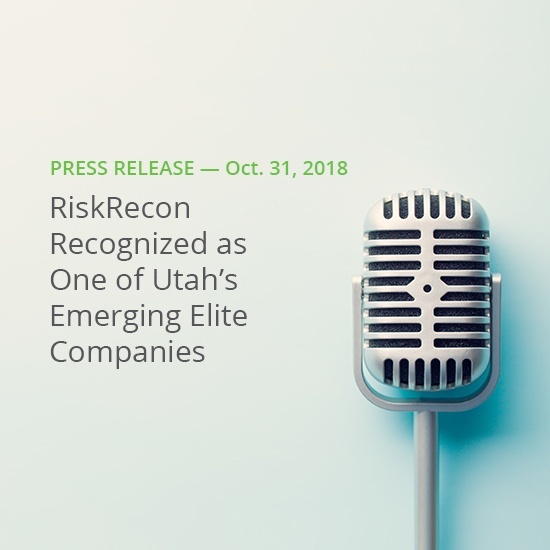 Salt Lake City, Utah — October 31, 2018 — RiskRecon today announced it was named to the 2018 Emerging Elite, MountainWest Capital Network’s (MWCN) annual list of the fastest-growing companies in Utah. RiskRecon was honored at the 24th annual Utah 100 Awards program, held at the Grand America Hotel in Salt Lake City. MWCN elected RiskRecon among its peers for the Emerging Elite award to showcase the company’s trajectory and for exemplifying the best of Utah’s startups. The Emerging Elite are selected among companies with less than five but more than two years of operation that show significant growth in those years and promise for future success. About MountainWest Capital Network MountainWest Capital Network (MWCN) is the largest business networking organization in Utah, consisting of entrepreneurs, venture capitalists, consultants, legal professionals, bankers, and educators. MWCN seeks to promote and recognize business growth and capital development in the state through a variety of award programs and activities. About RiskRecon RiskRecon is the only continuous vendor monitoring solution that delivers risk-prioritized action plans custom-tuned to match your risk priorities, providing the world’s easiest path to understanding and acting on third-party cyber risk. Partner with RiskRecon to build your scalable, third-party risk management program to realize dramatically better risk outcomes. To learn more about RiskRecon’s approach, request a demo or visit the website at www.riskrecon.com.